Awesome. Getting to work on that now. Last question - the various threads are independent of each other, yes? Yes. Rather than an elimination style tournament, everyone will get their own thread, and each thread will be considered its own continuity, unless you choose otherwise. Okay, only got one more character to post on my roster, and then I'm done. Mine are all up, although I did "cheat" a little by using web resources to fill in some of the sections. I did this, as noted in the entries, on purpose to provide myself an impartial/ objective perspective on the characters. Okay, I'm planning to post up a collection of scans of Wuji Chang to illustrate the kind of crazy stuff he does, but that'll probably have to wait until tomorrow night or Sunday. But I don't see that as a reason to delay things. So without further ado . 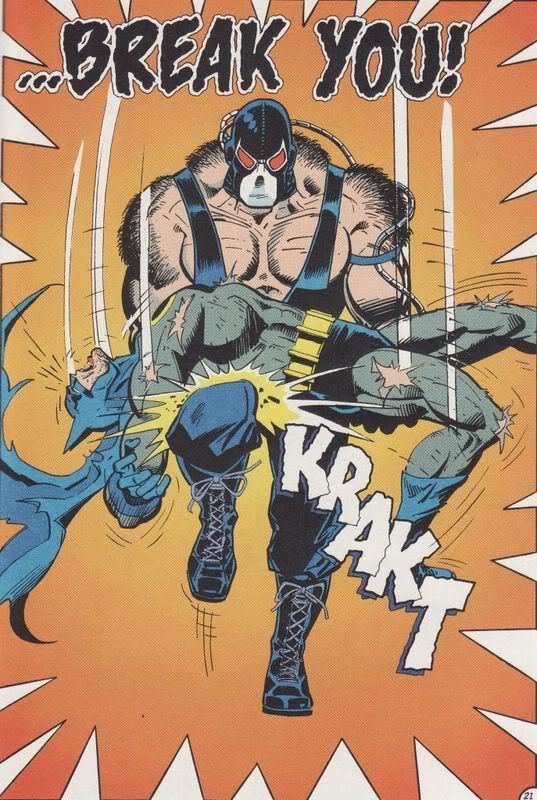 . .
Bane will break Cassandra. No offense, its just a Bat Family tradition.